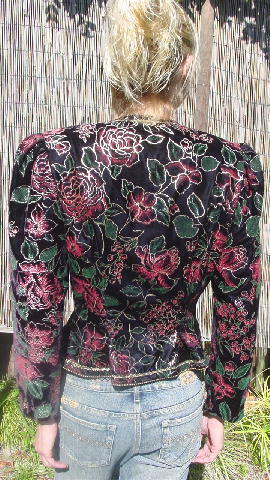 This velvet evening jacket is a Nah Nah Collection by Jonathan Tait. It has a black background and in certain lights it has a bit of a burgundy cast to it. 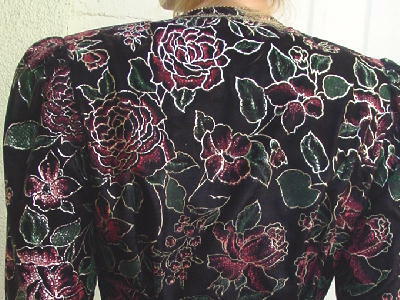 There is a design pattern of flowers and leaves in green and red with a painted texture. The leaves and flowers are outlined in gold paint. The front sides, neckline, and bottom edges all have little gold beads. There is a gold fleck cording 3/4" above or inward from the beads. There is a 14 1/4" deep V neckline and a one button and one interior snap closure. They have shoulder pads and long sleeves. The back has inverted bottom V's for movement and higher-up thin V's for more movement. The design and gold outlines have a tone-on-tone appearance.